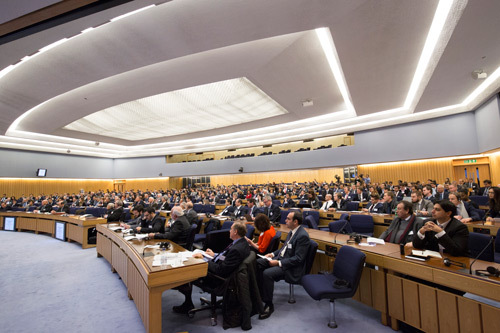 Global business leaders, diplomats, policy-makers and senior academics gathered at the International Maritime Organisation in November for the Eighth City of London Biennial Meeting. Organised by the Costas Grammenos Centre for Shipping, Trade and Finance at Cass Business School and sponsored by the Maria Tsakos Foundation, the Biennial focused on the theme of Striving for Stability in a Highly Uncertain World. The meeting welcomed more than 800 delegates over two days to discuss five major subjects under this theme. The subjects included World Economy; Banking & Finance; Energy and Shipping; Shipping Finance; and Innovation. The keynote address was given by the Rt Hon John Hayes CBE MP, Minister of State – Shipping and Ports, Department for Transport. Costas Th Grammenos CBE DSc, Centre Chairman and Biennial Founder, opened proceedings by welcoming delegates and paying warm tribute to the late Lord Howe of Aberavon (1926 – 2015) and Sir Gavyn Arthur (1951 – 2016), both strong supporters of the Centre and the Biennial. 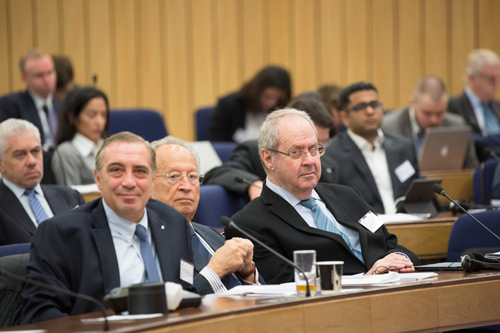 Delegates also heard opening remarks from Professor Sir Paul Curran, City, University of London and Mr Efthymios E. Mitropoulos KCMG, Chairman, Maria Tsakos Foundation and Secretary-General Emeritus, International Maritime Organisation. Professor Grammenos said the Biennial would focus specifically on the current geopolitical, financial, environmental and humanitarian challenges facing the world today and consider their impact on shipping, banking and finance. On the first day, the first panel discussed World Economy with speakers including Sir Winfried Bischoff, Chairman, Financial Reporting Council (Chair); Professor Charles Baden-Fuller, Centenary Professor of Strategy, Cass Business School; Mr Arjun Batra, Group Managing Director, Drewry Shipping Consultants Ltd; Lord Griffiths of Fforestfach, Vice-Chairman, Goldman Sachs; Mr Huw Pill, Chief European Economist, Goldman Sachs; Mrs Vicky Pryce, Board Member, Centre for Economics and Business Research; Lord Sterling of Plaistow; Professor Martin Stopford, Non-Executive President, Clarkson Research and Honorary Visiting Professor, Cass Business School; and Mr Nicholas Trimmatis, Chairman, Concept Business Group. The second panel considered Banking & Finance with speakers including Sir Graham Day, Counsel, Stewart McKelvery (Chair); Mr Kristian Andersson, Chief Executive Officer, SEB Ukraine; Mr Cyrus Ardalan, Chairman, OakNorth Bank; Mr Efthymios N. Christodoulou, Former Governor, Bank of Greece; Mr Nicholas Hadjiyiannis, Chief Executive Officer, Central Cooperative Bank of Cyprus; Professor Helen Louri-Dendrinou, Head of Department of Economics, Athens University of Economics and Business; Mr Ray Soudah, Chairman and Founding Partner, Millennium Associates AG and Mr Tomer Zaharovich, Co-Founder and Managing Partner, Sunstone Compliance Strategy Group. The third panel discussed Energy with speakers including Dr Nicholas P. Tsakos, Chief Executive Officer, Tsakos Energy Navigation Ltd and Chairman, Intertanko (Chair); Mr Irakli Menabde, Managing Director of Energy and Infrastructure, Georgian Co-Investment Fund; Mr Bron Sharman, Portfolio Manager, RCMA Asset Management; Mr Ole Slorer, Managing Director, Morgan Stanley Research; Mr Barry Wingate, Director, Natural Resources Group, HSBC Bank Plc and discussants Dr Panos Pouliasis, Senior Lecturer in Energy / Commodities and Finance, Cass Business School and Professor Michael N. Tamvakis, Director, MSc in Energy, Trade & Finance, Cass Business School. The fourth panel debated Shipping Markets with speakers including Mr Thanassis Martinos, Managing Director, Eastern Mediterranean Maritime Ltd (Chair); Ms Stavroula Betsakou, Head of Tanker Research, Howe Robinson Partners; Mr Nicolai Hansteen, Head of Corporate Development, Lorentzen & Stemoco and discussants Professor Amir Alizadeh, Professor of Shipping Economics and Finance, Cass Business School; Mr Arjun Batra, Group Managing Director, Drewry Shipping Consultants Ltd; Professor Nikos Nomikos, Director, MSc in Shipping, Trade & Finance, Cass Business School and Mr Harry Vafias, Founder and Chief Executive Officer, Stealthgas Inc.
On the second day, the introductory speech was delivered by His Excellency Mr Kitack Lim, Secretary General, International Maritime Organisation. The first panel discussed the Dry Market, hearing from Mr Alastair Marsh, Chief Executive Officer, Lloyd's Register Group (Chair) and speakers Mr Hugh Baker, Chief Financial Officer, Scorpio Bulkers Inc.; Mr Nicolaus Bunnemann, Managing Director, Atlantic Lloyd GmbH & Co. KG; Mr Lorenzo d'Amico, Deputy - Operations Manager, d'Amico Societa di Navigazione; Mr Hakki Deval, Managing Director, Deval Shipping; Mr Asaf Malamud, Deputy Chief Executive Officer, Portline Holdings Maritime Corporation and discussants Mr Arjun Batra, Group Managing Director, Drewry Shipping Consultants Ltd; Professor Eddy Van de Voorde, Professor of Port and Maritime Economics, University of Antwerp and Honorary Visiting Professor, Cass Business School. The second considered the Tanker Market with Dr. Anthony S. Papadimitriou, President, Onassis Foundation (Chair) and speakers Mr Laurent Bozzoni, Managing Director, Socatra Group; Mr Michael Fostiropoulos, Director, ALMI Tankers SA; Mr Adip Mittal, Director, Mercator International Pte. Ltd.; Mr Christian Oldendorff, Shipowner, Redereei Nord GmbH; Mr Nicolaus Oldendorff, Managing Director, Reederei Nord GmbH and discussant Professor Siri Pettersen Strandenes, Professor, Norwegian School of Economics; Honorary Visiting Professor, Cass Business School. The third panel discussed Shipping Finance, with reference to Banks and Export Credit Agencies, with Mr Michael Parker, Managing Director; Global Industry Head, Shipping, Logistics and Offshore, Citigroup Inc. (Chair) and speakers Mr Tarun Gulati, Senior Vice President, Credit and Asset Solution Group, DVB Bank SE; Mr Geir Lerkerod, Senior Vice President, Shipping, Offshore and Oil Services, Nordea Bank Norge ASA; Mr Alex Ryland, Senior Vice President, Shipping, Offshore and Logistics, DNB Bank ASA, London Branch; Mr Dimitris Sofianopoulos, Partner / Head of Greece and Head of Monaco, Norton Rose Fulbright LLP; Mr Christoph Toepfer, Chief Executive Officer, Borealis Maritime Ltd and discussant Dr. Anthony S. Papadimitriou, President, Onassis Foundation. The fourth panel discussed Shipping Finance with reference to Capital Markets and Private Equity, with Professor Costas Th. Grammenos CBE DSc, LRF Professor in Shipping, Trade and Finance, Cass Business School (Chair) and speakers Mr Axel Aas, Managing Director - Founding Partner, Clarksons Platou Project Finance AS; Mr Hugh Baker, Chief Financial Officer, Scorpio Bulkers, Inc.; Mr Nicholas Bornozis, President, Capital Link Inc.; Mr Claudio Chistè, Specialised Lending ICIB, Investec Bank; Mr John Dragnis, Chief Executive Officer, Goldenport Holdings Inc.; Mr Erik Helberg, Chief Executive Officer, Clarksons Platou Securities; Dr Nikos C. Papapostolou, Senior Lecturer in Shipping Finance; Co-Director, MSc in Shipping, Trade and Finance, Cass Business School; Mr Christoph Toepfer, Chief Executive Officer, Borealis Maritime Ltd and discussant Mr Arjun Batra, Group Managing Director, Drewry Shipping Consultants Ltd. The final panel considered Innovation with Professor Charles Baden-Fuller, Centenary Professor of Strategy, Cass Business School (Chair), and speakers Professor Costas Andriopoulos, Professor of Innovation and Entrepreneurship and Associate Dean for Entrepreneurship, Cass Business School; Mr Michael Fostiropoulos, Director, ALMI Tankers SA; Mr Philippos Kassimatis, Managing Director and Co-Founder, Maven Global; Professor Martin Stopford, Non-Executive President, Clarkson Research and Honorary Visiting Professor, Cass Business School and Professor Wayne Talley, Professor of Maritime and Supply Chain Management, Old Dominion University and Honorary Visiting Professor, Cass Business School. The speakers’ presentations can be found here. The Centre for Shipping Trade and Finance at Cass Business School was established by Professor Costas Th Grammenos CBE DSc in 1983. In April 2007, the Centre was renamed in honour of its founder. In 1999, Professor Grammenos established the City of London Biennial Meetings. The Centre pioneers postgraduate studies in Shipping, Trade and Finance and Energy, Trade and Finance offering the first specialist MSc degrees in these disciplines. Through its unique blend of theory and practice, the Centre has gained international recognition among industry leaders, policy-makers, government and academics.